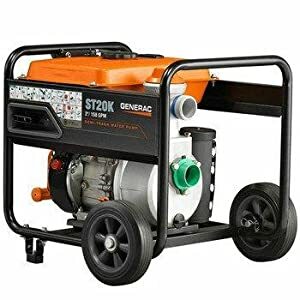 Specifically engineered to handle muddy or sandy water, the ST20K is powered by a 208cc Generac engine that pumps up to 158 gallons per minute. So it’s ideal your toughest applications. With features such as low-oil shut down to protect the engine from damage, it’s both durable and easy to use. 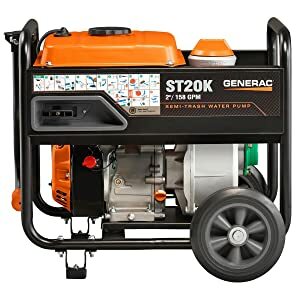 Specifically engineered to handle muddy or sandy water, the ST20K is powered by a 208cc Generac engine that pumps up to 158 gallons per minute. So it’s ideal for your toughest applications. With features such as low-oil shut down to protect the engine from damage, it’s both durable and easy to use. What are the main differences between clean water, semi-trash and trash pumps? 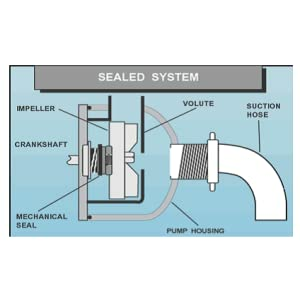 Seals and impellers are the main differences. Clean water pumps typically have a carbon ceramic mechanical seal versus the silicon carbide mechanical seals found on semi-trash and trash pumps. The impeller design is also quite different on a trash pump, its typically a 2-vane design versus a 4-vane design to allow for larger particulate to flow through. 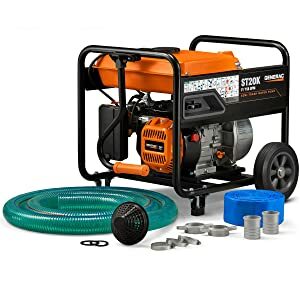 How do I know which type of pump to purchase? It really depends on the condition of the water you need to pump. If the water is sandy, muddy (abrasive) or has small particulates, you should purchase a semi-trash or trash pump. If the water you intend to pump is always clean like a swimming pool, hot tub or water garden, a clean water pump would be fine. Are there limitations to the height of the pump vs. water source? Yes, the maximum vertical suction lift on the CW15K and ST20K pumps is 26’ above the source in standard conditions. 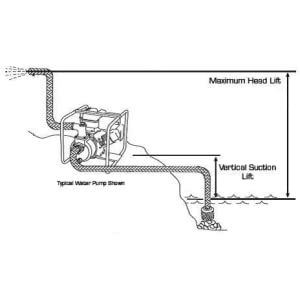 There are also limitations on how high you can pump water from the water source. The maximum head lift is 80ft on the CW15K and 108ft on the ST20K in standard conditions. 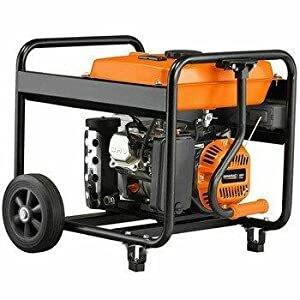 Q: How do I know what size pump to purchase? A: It all depends on how much water you need to pump and how quickly you need to pump it. A pump's performance is determined by many factors such as atmospheric pressure (how high the pump is above sea level), resistance from hoses, etc. A pump's performance is also measured in flow and expressed in gallons per minute or gallons per hour. The higher the flow the better the performance. 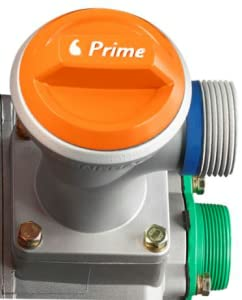 Q: Do I still need to add water if the pump is "Self Priming"? A: Yes. Most centrifugal pumps require the pump housing to be filled with water or manually primed before starting. What “Self-priming” really means is that you need to prime the pump yourself. Water must be added to remove the air from the pump housing and create a partial vacuum. Also, water cools and lubricates the mechanical seal until the pump is underway and water starts to flow freely. Q: Is it important to drain the pump after each use? A: Yes. Each pump has a drain at the bottom of the pump housing. It is very important to drain the pump after each use to prevent corrosion and more importantly freezing in the winter months. A frozen pump can cause the pump housing to crack.